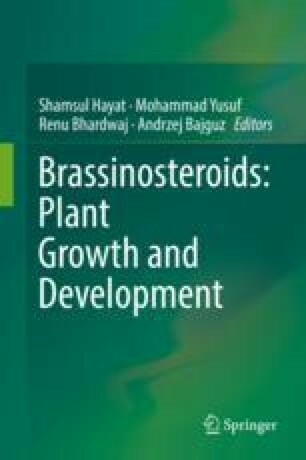 Brassinosteroids (BS), a class of polyhydroxylated steroidal plant hormones were collectively named as ‘Brassins’ after their initial discovery from the pollen grains of Brassica napus. They occur in whole plant kingdom and almost all plant parts. Pollen and immature seeds are the richest sources of BS. A spectrum of physiological, biochemical and molecular responses in plants have been attributed to BS, which include shoot and root growth, fertility and seed germination, cell elongation, vascular differentiation, xylem formation in epicotyls, and also in the regulation of expression of several genes involved in xylem development. They also affect cotyledon growth, root elongation, leaf formation and growth, and plant biomass. Ethylene production is another important physiological response in plant that has been attributed to BS activity. They have also been found to protect plants from various abiotic and biotic stress factors, such as salt, temperature, water, heavy metals and pathogens. BS also enhance the yield of several cereals, legumes, oilseed crops and crops of horticultural importance. In horticultural crops, they favour fruit production and quality of the fruits. This chapter describes various studies wherein BS have been exploited to enhance the productivity of different horticultural crops. Most importantly, they are naturally occurring and eco-friendly, thus they can easily replace the hazardous chemicals.